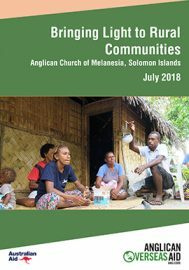 The Bringing Light to Rural Communities (BLTRC) Project is implemented by the Anglican Church of Melanesia in the Solomon Islands. The project has been running since 2010, funded through the Australian Government’s Australian NGO Cooperation Program (ANCP) as well as from donations from Anglicans in Australia. Now at the end of the third phase of activity, the goal of the project has developed over the past eight years, now including additional components that have been identified specific to the Solomon Islands context. As such the goal is to improve the quality of life in rural communities through access to solar lighting, income generating activities and gender awareness raising. This internal evaluation is designed to take stock at the end of the third project cycle, identifying success and challenges. There is particular emphasis on looking at the progress the project has made in the areas of solar, savings and gender based violence. Overall, the evaluation shows that the BLTRC Project has had an positive impact on the quality of life for rural communities with increased access to solar and strong community engagement with savings groups.